So after my husband blogged our way around Thailand we decided after a few glasses of vino that we should continue krapow. We have heaps of food adventures in Melbourne...it is such an awesome city full of amazing Thai and Vietnamese restaurants and produce that we decided we should continue blogging our Melbourne Thai and Vietnamese food adventures! To celebrate we made some yummy custard apple smoothies. These babies are delicious! So the smoothie obsession started with a visit to Quan Viet in Braybrook. We found this place with the help of the wonderful footscrayfoodblog. Lauren has one of my favourite blogs and has given us so many gems in the past that I am very much indebted to her. I was initially tempted by the Banh Khot as I had tried these in Hoi An and loved them. I also like the version at Thanh Ha 2 in Richmond but I think Quan Viet's a just that bit better. Anyway, back to the smoothies. On maybe our third visit to Quan Viet we saw the table near us order some smoothies and decided we need to try one. I have always had a soft spot for custard apples as my great grandmother had a tree in her yard when we were young and I remember them being so lovely and creamy. So of course we ordered the Custard Apple smoothie and were blown away. It was so much better than any boost or other smoothies we had tried before. Especially better than any smoothies we had tried to make at home which were always full of crunchy chunks of ice. This one was so creamy and airy with a velvety texture of sorbet. Well after that we were hooked and would drive to Braybrook just to buy smoothies. We did our usual trick of watching very closely as they were being made to try and find out where we were going wrong at home. It was then that we discovered the brand of blender being used was a commercial Blendtec blender of the 'will it blend' YouTube fame. You might have heard of them; the YouTube videos show iPhones and other random items being blended to dust, 'don't breath this'. So of course I decided that I had to have one, you can imagine my disappointment when I discovered that they sell for $800! I am pretty good at justifying expensive purchases but $800 for a blender was a bit of a stretch. I did a bit of research and worked out that the commercial blenders are all around 1,200 to 1,500 watts which gives them the power to crush the ice into a velvety powder. 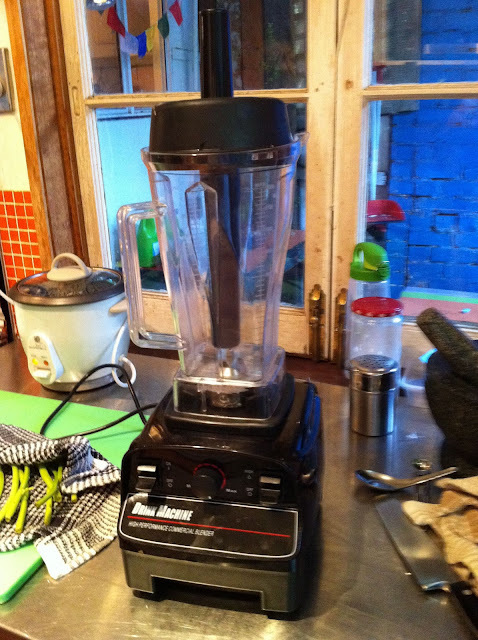 After a few crazy ideas like trying to import a Blendtec from the UK I found a cheap chinese made commercial blender on eBay with 1,200 watts or power for only $100 plus $30 postage. You beauty! It was immediately purchased and I counted the days til it arrived. 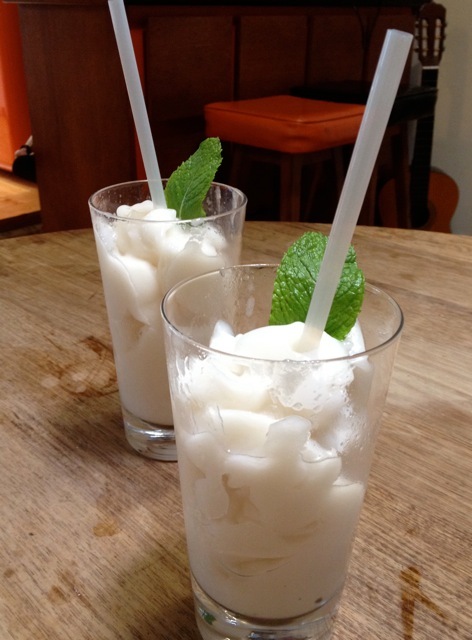 The other discovery was the frozen soursop (custard apple) drinks that are used to make the smoothies. I found these in Richmond and purchased a few to use as soon as the blender arrived. From watching them being made we worked out that the only ingredients were the frozen soursop, ice and sugar syrup. I was pretty sure how to make sugar syrup but thought a google couldn't hurt. I decided on a recipe from the khmerkromrecipes website. I thought 2 cups of sugar was a bit excessive so I toned it down to one cup.